I need some green beans. Do they have ‘Provider’? Yes, good, I need a packet of those, and oh, look, there’s ‘Kentucky Wonder’ Pole Beans. I think my aunt said those were here favorites, so I’ll get some of those. Yes, check, I need ‘Cherry Belle’ radishes. And there are those ‘Trusty’ tomatoes. That’s what I really want. Might as well try this early tomato ‘Stupice’. It looks good, I wonder if I can get a tomato off of it before 4th of July? Oh, onions. I grew those from seed last year and they did well, so I’ll just get this ‘Parade Bunching’ variety because that’s all they have. ‘Bulls Blood’ beet sounds good. Goodness, I have to try a lettuce called ‘Marvel of Four Seasons’. And so on until I had ordered 25 packets of seeds. Add to that the seven packets I ordered from another company, and I’m off to a good start. I used no lists and did no double-triple checking from one seed company to another to figure out who had the best deal. I just picked a company to order from and started ordering. Really, that’s how I order. It’s mostly from memory, a lot on impulse. It may look like “random acts of seed purchasing”, and perhaps it is a little bit, but after 23 years of tending my own vegetable garden, 13 years of it in my current location, I have a pretty good idea of what seeds I need to order each year. Plus, some of my best vegetable varieties have been impulse purchases, like ‘Cue Ball’ squash, which is now my favorite variety of summer squash. I’m afraid if I made a list and stuck to it, I’d miss out on the next ‘Cue Ball’ squash! But once I’m done ordering I will make a list so I can keep track of what I have and when to sow it. So now that I’ve startled one or two of you with my confession of “random acts of seed purchasing”, I’m ready to go to the next seed company website on my list. Do you start out by seeing what you have left from last year? You go, girl! That is exactly the way I do it! No checking other places really at all. I just pick out what I want, if it sounds cool, I'll buy it. I do look at what I have left from last year, but then I go totally nuts! Go crazy, seeds are a great addiction! Impulsive seed buys are the best way to try new things. It's never planned and you never know what you may get.. It's great. Impulsive seed buying often brings good results as I have found.Happy gardening! It is so easy to do this especially when the photos are so beautiful! I have my three or four seed suppliers and I just try to spread out my list. This year I am even keeping track of what I've ordered from where, or plan to buy off the seed rack locally. I also share some seeds. I do not need a whole packetful of zucchini seeds! Seed packets are so alluring - it's hard to resist. This is pitch perfect horticultural addiction writing! I can't resist random seed purchaing either. It always starts off fairly reasonably, low key, "Oh I'll just pick up a packet of Impomoea whilst I remember", and before you know it, I have the complete range including Grandpa Otis. 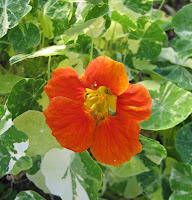 I found your blog via Anne Higgins poetry / garden blog Scattered Showers. Great find.